The terms Hmong (IPA:[m̥ɔ̃ŋ]) and Mong ([mɔ̃ŋ]) both refer to an Asian ethnic group in the mountainous regions of southern China. There, they remain one of the largest sub-groups in the Miao (Chinese:苗族) minzu (nationality) along with other related ethnic minorities. Beginning in the eighteenth century, conflict with Han Chinese settlers migrating to the south caused Hmong groups began a gradual mass migration to Southeast Asia. As a result, Hmong currently live in several countries in Southeast Asia, including northern Vietnam, Laos, Thailand, and Myanmar. Traditionally, the Hmong practice subsistence agriculture and the harvesting of timber. During the last century, the Hmong have been caught up in the political instability which affected Southeast Asian nations. Many Hmong people in Laos fought against the communist-nationalist Pathet Lao during the Secret War. When the Pathet Lao took over the government in 1975, Hmong people were singled out for retribution, and a large number fled to Thailand. Many were resettled in Western countries, including the United States, Australia, France, French Guiana, and Canada. Others were returned to Laos under United Nations-sponsored repatriation programs. Around 8,000 Hmong refugees remain in Thailand. Hmong people have their own term for the subcultural divisions among themselves; two of the largest are White Hmong (Hmong Der) and Green or Blue Mong (Mong Leng). In the Romanized Popular Alphabet, developed in the 1950s, in Laos, these terms are written Hmoob Dawb (White Hmong) and Moob Leeg (Green Mong). The doubled vowels indicate nasalization, and the final consonants indicate with which of the eight lexical tones the word is pronounced. White Hmong and Green Mong people speak mutually intelligible dialects of the Hmong language, with some differences in pronunciation and vocabulary. One of the most obvious differences is the use of the aspirated /m/ in White Hmong (indicated by the letter "h") not found in the Green Mong dialect. 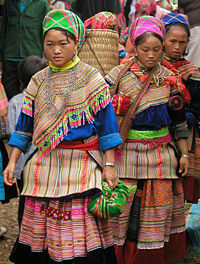 Other groups of Hmong/Mong people include the Black Hmong (Hmoob Dub), Striped Hmong (Hmoob Txaij/Hmoob Quas Npab), Hmong Shi, Hmong Pe, Hmong Pua, and Hmong Xau. Since 1949, Miao has been an official term for one of the fifty-five official minority groups recognized by the government of the People's Republic of China. They live mainly in southern China, in the provinces of Guizhou, Hunan, Yunnan, Sichuan, Guangxi, Hainan, Guangdong, Hubei, and elsewhere in China. According to the 2000 census, the number of "Miao" in China was estimated to be about 9.6 million. The Miao nationality includes Hmong/Mong people as well as other culturally- and linguistically-related ethnic groups who do not call themselves either Hmong or Mong. These include the Hmu, Kho (Qho) Xiong, and A Hmao. The White Miao (Bai Miao) and Green Miao (Qing Miao) are both Hmong/Mong groups. Usage of the term "Miao" in Chinese documents dates back to the Shi Ji (first century B.C.E.) and the Zhan Guo Ce (late Western Han Dynasty). During this time, it was generally applied to people of the southern regions thought be descendants of the San Miao kingdom (dated to around the third century B.C.E.) The term does not appear again until the Ming dynasty (1368–1644), as by then it had taken on the connotation of "barbarian." Interchangeable with "man" and "yi," it was used to refer to the indigenous people of the south-western frontier who refused to submit to imperial rule. During this time, references to Raw (Sheng) and Cooked (Shu) Miao appear, referring to level of assimilation and political cooperation of the two groups. Not until the Qing dynasty (1644–1911) do more finely-grained distinctions appear in writing. Even then, discerning which ethnic groups are included in various classifications can be problematic. This inconsistent usage of "Miao" makes it difficult to say for sure whether the Hmong/Mong people are always included in these historical references. Linguistic evidence, however, places Hmong/Mong people in the same regions of southern China that they inhabit today for at least the past 2,000 years. By the mid-eighteenth century, classifications had become more specific and it is easier to identify references to Hmong/Mong people. Hmong/Mong people are referred to by other names in Southeast Asia, including: Vietnamese: Mèo or H'Mông; Thai: แม้ว (Maew) or ม้ง (Mong); Burmese: mun lu-myo. "Mèo," or variants thereof, is considered highly derogatory by many Hmong/Mong people and is infrequently used today outside of Southeast Asia. Because the Hmong lived mainly in the highland areas of Southeast Asia and China, the French occupiers of Southeast Asia gave them the name Montagnards or "mountain people," but this should not be confused with the Degar people of Vietnam, who were also referred to as Montagnards. When Western authors came in contact with Hmong and Mong people, beginning in the eighteenth century, they referred to them in writing by ethnonyms assigned by the Chinese (that is, Miao, or variants). This practice continued into the twentieth century. Even ethnographers studying the Hmong/Mong people in Southeast Asia often referred to them as Mèo, a corruption of Miao applied by Thai and Lao people to the Hmong/Mong. (As noted above, this term is considered to be highly derogatory by many Hmong/Mong people.) In the middle of the twentieth century, a concerted effort was made to refer to Hmong/Mong by their own ethnonyms in scholarly literature. By the 1970s, it became standard to refer to the entire ethnic group as "Hmong." This was reinforced during the influx of Hmong/Mong immigrants to the United States after 1975. Research proliferated, much of it being directed toward the American Hmong Der community. Several states with Hmong/Mong populations issued official translations only in the Hmong Der dialect. At the same time, more Mong Leng people voiced concerns that the supposed inclusive term "Hmong" only served to exclude them from the national discourse. During the passage of California State Assembly Bill (AB) 78, in the 2003–2004 season, which encouraged changes in secondary education curriculum to include information and oral histories about the Secret War and the role of Hmong/Mong people in the war, the language of the bill was changed from "Hmong" people to "Southeast Asians," a more broadly inclusive term. Some non-Chinese Hmong object to the use of the appellation "Miao" in China, and advocate that the term Hmong or Mong be used not only for designating their dialect group, but also for the other Miao groups living in China. They claim that the word "Miao" is a derogatory term, with connotations of barbarism, that probably should not be used at all. The term "Miao" was later adapted by Tai-speaking groups in Southeast Asia, where it took on offensive associations for Hmong people, despite its official status. In modern China, the term "Miao" does not carry these negative associations and people of the various sub-groups that constitute this officially recognized nationality freely identify themselves as Miao or Chinese, typically reserving more specific ethnonyms for intra-ethnic communication. During the struggle for political recognition after 1949, it was actually members of these ethnic minorities who campaigned for identification under the umbrella term "Miao," in order to take advantage of its familiarity and associations with historical political oppression. The early history of the Hmong has proven difficult to trace, but theories that place the origin of the Hmong/Mong people in Mesopotamia, Siberia, or Mongolia have been disputed by recent studies. According to Ratliff, there is linguistic evidence to suggest that they have occupied the same areas of southern China for at least the past 2,000 years. Evidence from mitochondrial DNA in Hmong-Mien/Miao-Yao language speaking populations supports the southern origins of maternal lineages even further back in time, although Hmong/Miao speaking populations show more contact with northeast Asians (that is, northern Han) than Mien/Yao populations. Historical Chinese documents describe that area being inhabited by 'Miao' people, a group with whom Hmong people are often identified. The history of the "Miao," however, cannot be equated with the history of the Hmong. Although the term "Miao" is used today by the Chinese government to denote a group of linguistically and culturally related people (including the Hmong, Hmu, Kho Xiong, and A Hmao), it has been used inconsistently in the past. Throughout the written history of China, it was applied to a variety of peoples considered to be marginal to Han society, including many who are unrelated to contemporary Hmong/Mong people. Christian Culas and Jean Michaud note: "In all these early accounts, then, until roughly the middle of the nineteenth century, there is perpetual confusion about the exact identity of the population groups designated by the term Miao. We should therefore be cautious with respect to the historical value of any early associations." Conflict between Miao groups and newly arrived Han Chinese settlers increased during the eighteenth-century under repressive economic and cultural reforms imposed by the Qing Dynasty. This led to armed confrontation and large-scale migrations continuing into the late nineteenth century, the period during which most Hmong people emigrated to Southeast Asia. The migration process began as early as the late-seventeenth century, before the time of major social unrest, when small groups went in search of better agricultural opportunities. The presence of the Hmiong in Viet Nam has been attested since the early eighteenth century. During the colonization of Tonkin (1883–1954), a number of Hmong joined the nationalists and communists, while Christianized Hmong sided with the French. Numerous Hmong were involved on both sides I the Battle of Dien Bien Phu (1954). After the Viet Minh victory, pro-French Hmong had to migrate to Laos and South Viet Nam. In 1992, the two major agricultural activities of the Hmong in Viet Nam, the cultivation of poppies and the coffin wood trade with China, were made illegal, and cash cropping is now their main economic activity. From July 1919 to March 1921, the Hmong of French Indochina revolted against the colonial authorities in what the French called the War of the Insane (Guerre de Fou), and what the Hmongs call Roj Paj Cai (named after the leader Paj Cai, but literally means, "The War of the flowering of the Law"). The Hmong have resided in Laos nearly as long as they have been in Viet Nam. After the Pacific War (1941-1945), Hmong on the Xieng Khouang plateau established closer ties with the French. A rivalry between the Lo and Ly resulted in the clans taking opposing sides during the Laotian Civil War. 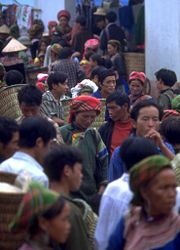 Several thousand Hmong participated in the conflict but many also attempted to avoid involvement. After the communist victory in 1975, it is estimated that 30 percent of the Hmong living in Laos crossed the border, although this number is difficult to substantiate. Hmong presence in Thailand is documented from the end of the nineteenth century. Initially they were ignored by the government, but in the early 1950s, initiatives were taken to establish political connections with them. From 1967 to 1982, the Hmong tried to remain uninvolved in the armed conflicts taking place in northern Thailand. Recent efforts have been made to sedentarize the mountain population and introduce national education and viable agricultural techniques, in order to integrate the Hmong into the national identity. In 1995, there were 124,000 Hmong in Thailand (Culas and Michaud 1997). While China has the largest population of Hmong people, an exact figure is hard to determine. According to the 1990 census, of the 7.4 million Miao people, 5.4 million were recorded as speaking a Miao language. Of these, around 2 million spoke a dialect of the Hmong language. Currently, based on projected growth rates, along with the inclusion of previously overlooked dialects, the number of speakers of the Hmong language in China has been estimated to be around 2.8 million. Black Hmong women in Sa Pa, Vietnam. There is also small population of Hmong people in Myanmar, but no exact figure is available. Within the United States, California, Minnesota, Wisconsin, and North Carolina have the highest concentrations of Hmong people. In the early 1960s, the U.S. Central Intelligence Agency (CIA) began to recruit the indigenous Hmong people in Laos to join fighting the Vietnam War, designating them as a Special Guerrilla Unit, led by General Vang Pao. Over 80% of the Hmong men in Laos were recruited to fight in the U.S. Secret War in Laos. The Special Guerrilla Unit served as a counter attack unit to block the Ho Chi Minh Trail, the main military supply route from the north to the south, and to rescue downed American pilots, suffering a very high casualty rate. More than 40,000 Hmong were killed in the frontline, countless men were missing in action, and thousands more were injured and disabled. General Vang Pao led the Region II (MR2) defense against an incursion from the Vietnam People's Army (NVA) from his headquarters in Long Cheng, also known as Lima Site 20 Alternate (LS 20A). At the height of its activity, Long Cheng became the second largest city in Laos, with an estimated population of 300,000, including 200,000 ethnic Hmong and 100,000 people of other ethnic backgrounds. Long Cheng became a micro-nation operational site with its own bank, airport, school system, officials, and many other facilities and services in addition to its military units. Before the end of the Secret War, Long Cheng would fall in and out of General Vang Pao's control. The Laotian Civil War began around the time that the U.S. became officially involved in the Vietnam War. Following the U.S. withdrawal from Vietnam in 1975, the Lao kingdom was overthrown by the communists, and the Hmong people became targets of retaliation and persecution. While some Hmong people returned to their villages and attempted to resume life under the new regime, thousands more made the trek to and across the Mekong River into Thailand, often under attack. This marked the beginning of a mass exodus of Hmong people from Laos. Those who made it to Thailand generally were held in squalid United Nations refugee camps. Nearly twenty years later, in the 1990s, a major international debate ensued over whether the Hmong should be returned to Laos, where opponents of their return argued they were being subjected to persecution, or afforded the right to immigrate to the U.S. and other Western nations. Laos: Hmong girls meet possible suitors while playing a ball-throwing game. Of those Hmong who did not flee Laos, somewhere between two and three thousand were sent to re-education camps where political prisoners served terms of three to five years. Many Hmong died in these camps, after being subjected to hard physical labor and harsh conditions. Thousands more Hmong people, mainly former soldiers and their families, escaped to remote mountain regions, particularly Phou Bia, the highest (and thus least accessible) mountain peak in Laos, where they remained in hiding to avoid military retaliation and persecution. Spiritual leader Zong Zoua Her rallied his followers in a guerrilla resistance movement called Chao Fa (RPA: Cob Fab). Initial military successes by these small bands led to military counter-attacks by government forces, including aerial bombing and heavy artillery, as well as the use of defoliants and chemical weapons. Today, small groups of Hmong people, many of them second or third generation descendants of former CIA soldiers, remain internally displaced in remote parts of Laos, in fear of government reprisals. Faced with continuing military operations against them by the government and a scarcity of food, some groups have begun coming out of hiding, while others have sought asylum in Thailand and other countries. In 1989, the UNHCR, with the support of the United States government, instituted the Comprehensive Plan of Action, a program to stem the tide of Indochinese refugees from Laos, Vietnam, and Cambodia. Under the plan, the status of the refugees was to be evaluated through a screening process. Recognized asylum seekers were to be given resettlement opportunities, while the remaining refugees were to be repatriated under guarantee of safety. In 1993, Vue Mai, a former Hmong soldier who had been recruited by the U.S. Embassy in Bangkok to return to Laos as proof of the repatriation program's success, disappeared in Vientiane. According to the U.S. Committee for Refugees, he was arrested by Lao security forces and was never seen again. Following the Vue Mai incident, debate over the Hmong's planned repatriation to Laos intensified greatly, especially in the U.S., where it drew strong opposition from many American conservatives and some human rights advocates. Debate on the issue escalated quickly. The Republican-led U.S. Senate and U.S. House of Representatives both appropriated funds to resettle the remaining Thailand-based Hmong in the U.S.; Clinton, however, responded by promising a veto of the legislation. Republicans called several Congressional hearings on alleged persecution of the Hmong in Laos, in an apparent attempt to generate further support for their opposition to the Hmong's repatriation to Laos. In the 1990s, many Flower Hmong switched from their traditional colorful dress to western clothing. Although some accusations of forced repatriation were eventually disproved, thousands of Hmong people refused to return to Laos. In 1996, as the deadline for the closure of Thai refugee camps approached, and under mounting political pressure, the U.S. agreed to resettle Hmong refugees who passed a new screening process. Around 5,000 Hmong people who were not resettled at the time of the camp closures sought asylum at Wat Tham Krabok, a Buddhist monastery in central Thailand where more than 10,000 Hmong refugees were already living. The Thai government attempted to repatriate these refugees, but the Wat Tham Krabok Hmong refused to leave and the Lao government refused to accept them, claiming they were involved in the illegal drug trade and were of non-Lao origin. In 2003, following threats of forced removal by the Thai government, the U.S., in a significant victory for the Hmong, agreed to accept 15,000 of the refugees. Several thousand Hmong people, fearing forced repatriation to Laos if they were not accepted for resettlement in the U.S., fled the camp to live elsewhere within Thailand where a sizable Hmong population has been present since the nineteenth century. In 2004 and 2005, thousands of Hmong fled from the jungles of Laos to a temporary refugee camp in the Thai province of Phetchabun. These Hmong refugees, many of whom are descendants of the former-CIA Secret Army and their relatives, claim that they have been attacked by both the Lao and Vietnamese military forces operating inside Laos as recently as June 2006. The refugees claim that have continued almost unabated since the war officially ended in 1975, and have become more intense in recent years. and in a comprehensive report which includes summaries of claims made by the refugees and was submitted to the U.N. in May 2006. The European Union, UNHCHR, UNHCR, and international groups have spoken out about the forced repatriation. The Thai foreign ministry has said that it will halt deportation of Hmong refugees held in Detention Centers Nong Khai, while talks are underway to resettle them in the Australia, Canada, Netherlands, and the United States. For the time being, countries willing to resettle the refugees are hindered from proceeding with immigration and settlement procedures because the Thai administration does not grant them access to the refugees. Plans to resettle additional Hmong refugees in the U.S. have been complicated by provisions of President Bush's Patriot Act and Real ID Act, under which Hmong veterans of the Secret War, who fought on the side of the United States, are classified as terrorists because of their historical involvement in armed conflict. Many Hmong/Mong war refugees resettled in the United States after the Vietnam War. Beginning in December 1975, the first Hmong/Mong refugees arrived in the U.S., mainly from refugee camps in Thailand; however, only 3,466 were granted asylum at this time under the Refugee Assistance Act of 1975. In May of 1976, another 11,000 were allowed to enter the United States, and by 1978 some 30,000 Hmong/Mong people had immigrated. This first wave was made up predominantly of men directly associated with General Vang Pao's secret army. It was not until the passage of the Refugee Act of 1980 that families were able to come in the U.S., becoming the second-wave of Hmong/Mong immigrants. Today, approximately 270,000 Hmong/Mong people reside in the United States, the majority of whom live in California (65,095 according to the 2000 U.S. census), Minnesota (41,800), and Wisconsin (33,791). Fresno, Merced, Minneapolis-St. Paul, Eau Claire, La Crosse, Madison, Milwaukee, and Wausau, Wisconsin have especially high concentrations of Hmong/Mong people. There are also smaller Hmong/Mong populations scattered across the country, including Western North Carolina (Hickory, Morganton, Charlotte), Linda Vista, California, Sacramento, California, Stockton, California, Winooski, Vermont, and Lancaster County, Pennsylvania, centered around the towns of Ephrata, Pennsylvania and Denver, Pennsylvania. There is also a small community of several thousand Hmong who migrated to French Guyana in the late 1970s and early 1980s. Even though most Hmong/Mong families speak a language other than English at home, many Hmong/Mong Americans are rapidly blending into mainstream American society, and young people are losing aspects of their cultural identity at a fast pace. To counter this, the Hmong/Mong community has set up associations and media that encourage people to maintain language and culture, such as the The Hmong Times newspaper. ↑ 1.0 1.1 Nicholas Tapp, "Cultural Accommodations in Southwest China: The 'Han Miao' and Problems in the Ethnography of the Hmong," Asian Folklore Studies, 61 (2002): 78. ↑ Norma Diamond, "Defining the Miao: Ming, Qing, and Contemporary Views," in Cultural Encounters on China's Ethnic Frontiers, ed. Stevan Harrell (Seattle: Univ. of Washington Press, 1995). ↑ Martha Ratliff, "Vocabulary of environment and subsistence in the Hmong-Mien Proto-Language," in Hmong/Miao in Asia: 160. ↑ Dao Yang, Hmong At the Turning Point (Minneapolis: WorldBridge Associates, Ltd., 1993). ↑ Kao-Ly Yang, History of the Assembly Bill AB78. Retrieved December 18, 2007. ↑ Lee Romney, L.A. Times, May 24, 2003. ↑ Cheung Siu-Woo, "Miao Identity in Western Guizhou: Indigenism and the politics of appropriation in the southwest china during the republican period," in Hmong/Miao in Asia: 237-240. ↑ Louisa Schien, "Hmong/Miao Transnationality: Identity Beyond Culture," in Hmong/Miao in Asia: 274-5. ↑ Martha Ratliff, "Vocabulary of Environment and Subsistence in Proto-language," p. 160. ↑ Bo Wen, et al. "Genetic Structure of Hmong-Mien Speaking Populations in East Asia as Revealed by mtDNA Lineages," Molecular Biology and Evolution 2005, 22(3): 725–734. Retrieved December 18, 2007. ↑ Christian Culas and Jean Michaud, "A Contribution to the Study of Hmong (Miao)," in Hmong/Miao in Asia, ed. Nicholas Tapp, et al. (Chiang Mai: Silkworm Books, 2004), 64. ↑ Culas & Michaud, 68–74. ↑ Keat Gin Ooi, Southeast Asia a Historical Encyclopedia, from Angkor Wat to East Timor (Santa Barbara, CA: ABC-CLIO, 2004, ISBN 9781576077702), 597. ↑ Jacques Lemoine, What is the actual number of the (H)mong in the World, Hmong Studies Journal, Vol 6, 2005. Retrieved December 18, 2007. ↑ Amnesty International, Hiding in the jungle: Hmong under threat. Retrieved December 18, 2007. ↑ Wayne Carroll and Victoria Udalova, Who is Hmong? Questions and Evidence from the U.S. Census, Hmong Studies Journal, Vol 6, 2005. Retrieved December 18, 2007. ↑ Lemoine, "What is the number of the (H)mong in the world." ↑ Jane Hamilton-Merritt, Tragic Mountains (Indiana University Press, 1993, ISBN 0253327318). ↑ www.cal.org, Early History, The Hmong: An Introduction to their History and Culture. Retrieved December 18, 2007. ↑ Hmongnet, Minority Policies and the Hmong in Laos. Retrieved December 18, 2007. ↑ David Kinchen, 438 former "Cob Fab" removed by helicopter after they came out of hiding, Hmong Today. Retrieved March 22, 2007. ↑ “Laos agrees to voluntary repatriation of refugees in Thailand,” U.P.I., June 5, 1991. ↑ J. Karen, “Lao Refugees Return Home Under European Union Repatriation Program,” Associated Press Worldstream. ↑ Jane Hamilton-Merritt, Tragic Mountains, xix-xxi. ↑ Michael Johns, Acts of betrayal—persecution of Hmong, National Review. Retrieved January 15, 2009. ↑ United States Embassy (Thailand),Refugee and Migration Affairs Unit, Reports on results of investigations of allegations concerning the welfare of Hmong refugees and asylum seekers in Thailand and Laos (1992). Retrieved December 18, 2007. ↑ Michael Johns, Acts of betrayal—persecution of Hmong. Retrieved July 27, 2007. ↑ Steve Gunderson, “STATE DEPARTMENT OUTLINES RESETTLEMENT GUIDELINES FOR HMONG REFUGEES,” Congressional Press Releases, May 18, 1996. ↑ “Laos refuses to take back Thai-based Hmong refugees,” Deutsche Presse-Agentur, August 20, 1998. ↑ U.S. Department of State, Refugee Admissions Program for East Asia. Retrieved December 18, 2007. ↑ Hmong Resettlement Task Force, History. Retrieved December 18, 2007. ↑ BBC, Hmong refugees pleading to stay. Retrieved December 18, 2007. ↑ Rebecca Sommer, Video clips from "Hunted Like Animals." Retrieved December 18, 2007. ↑ Earth peoples, Report on The Situation. Retrieved December 18, 2007. ↑ European Communities, Summary: Thailand. Retrieved December 18, 2007. ↑ Amnesty, End of the line for executions? Retrieved December 18, 2007. ↑ Gesellschaft für bedrohte Völker, Deportation of Hmong Lao refugees Stopped in Last Minute. Retrieved December 18, 2007. ↑ UNPO, Hmong: UNHCR Protests Refugee Deportation. Retrieved December 18, 2007. ↑ BBC, Thailand halts Hmong repatriation. Retrieved December 18, 2007. Alisa, Kaarin. 2007. The Hmong. Detroit, MI: Greenhaven Press. ISBN 9780737735000. Fadiman, Anne. 1997. The Spirit Catches You and You Fall Down: A Hmong Child, Her American Doctors, and the Collision of Two Cultures. Farrar, Straus and Giroux. ISBN 0-374-26781-2. Faderman, Lillian, and Ghia Xiong. 1998. I Begin my Life all Over the Hmong and the American Immigrant Experience. Boston: Beacon Press. ISBN 9780807072349. Geddes, W.R. 1976. Migrants of the Mountains: The Cultural Ecology of the Blue Miao (Hmong Njua) of Thailand. Oxford: The Clarendon Press. Hamilton-Merritt, Jane. 1993. Tragic Mountains the Hmong, the Americans, and the Secret Wars for Laos, 1942-1992. Bloomington: Indiana University Press. ISBN 9780253207562. Livo, Norma J. and Dia Cha. 1991. Folk Stories of the Hmong Peoples of Laos, Thailand, and Vietnam. Englewood, CO: Libraries Unlimited. ISBN 9780872878549. TYPN 1992. The section on nomenclature draws heavily on Thai-Yunnan Project Newsletter, Number 17. Department of Anthropology, Australian National University. Material from that newsletter may be freely reproduced with due acknowledgment. The Hmong in America, by Jeff Lindsay. This page was last modified on 11 January 2018, at 16:41.